Cable television subscription rates falling; but where are they going? BGR reports that 400,000 cable and satellite television subscribers ditched their service this year. This apparent declining trend is backed up by the graph over at NCTA (NTCA is a cable provider trade group). You can see from that graph that the number of cable television subscribers peaked in 2001. So where are these folks getting their entertainment? 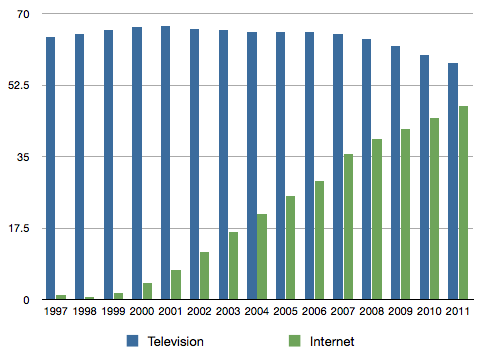 Even more interesting is the graph of cable internet subscribers over a similar time period. It looks like cable internet started taking off at about the time television subscribers peaked. The graph below uses the data from NCTA/SNL Kagan.